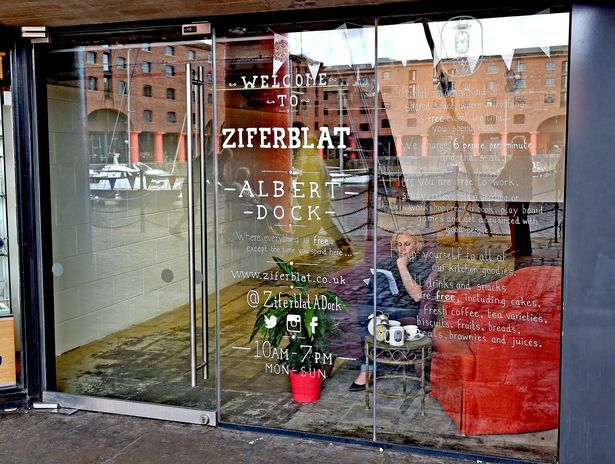 Hidden amongst a string of eating outlets and mainstream coffee shops, in the Albert Dock, if you look hard enough you will stumble across a small glass-fronted place with the name ‘Ziferblat’ painted in bold white lettering across its windows. At a brief glance, Ziferblat is easy to overlook; nestled between the glittering goodies of a jewellery shop and the bold red and blue displays of a tourist souvenir emporium. However, if you are the kind of person who enjoys a cup of tea in a homely living room set up, then perhaps the comfy red armchairs huddled around a dainty tea set in the window will lure you in. Upon entering, you’ll find that the café has a much more personal approach than, for instance, large café franchises; lending themselves to lengthy queues and shouting your order. Instead, you are asked for your name, reminded of the time and welcomed into a space resembling someone’s lounge. Despite there being no coherent theme to the décor, it is still quaint and inviting. The room is arranged into clusters of armchairs, spongy couches and tables at which you can eat, drink and perhaps play one of the collection of board games stacked on a bookshelf in the corner. There is a self-service kitchen area complete with hot drink machines, biscuit jars and floral patterned cake stands that wouldn’t look out of place at the Mad Hatter’s tea party. The range of food on offer is generous and varied with different flavoured cakes; including fruit, ginger and iced cakes. There is also a selection of cereals and the option to have toast with toppings such as peanut butter or Marmite. All of this is well worth the cost of 8p per minute; especially if you consider the expensive alternatives at mainstream coffee outlets! It is perhaps worth mentioning that if you should develop a strong and emotional (maybe even romantic) attachment to the chair you sat on whilst there, you can purchase it; along with anything else you like the look of; including the wall art and pretty tea cups! 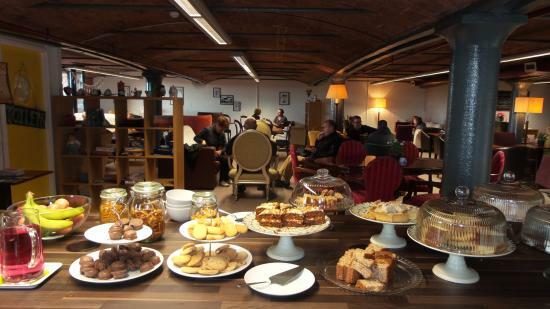 Ziferblat is a perfect place for a casual afternoon tea with family or friends, in between strolls along the docks or a spot of shopping at Liverpool One. It is somewhere to unwind without feeling as if you’re outstaying your welcome. So, if you would like to eat cake in a room taken from the set of a Wes Anderson film; then head on down to Ziferblat. I would personally recommend trying one of the coffees (from the largest coffee machine), sprinkled with chocolate and topped off with whipped cream. And remember, one of the most important rules a student can learn – time is money. I am a first year English student at the University of Liverpool. In my spare time I love to watch films and listen to or play music.